Valentine’s Day in Hawaii is everything you need this February 14. The Big Island is an excellent choice for couples seeking to relax and recharge or reconnect with new adventures. Wondering what to do first? Our beautiful beaches are an obvious attraction, but on the Big Island there’s much more to do and see. For Valentine’s couples looking to adventure, visit Hawaii Volcanoes National Park. The park is home to two active volcanoes: Kīlauea and Mauna Loa. It offers nearly 324,000 acres of land to explore and many unique hiking and camping opportunities under the stars. For the conservationist couple, try Big Island Bees and Ocean Rider Seahorse Farm. Big Island Bees is owned and operated by a local family whose bees produces organic honey from Hawaiian blossoms like Lehua, macadamia Nut and Wilelaiki. At their facility, they offer fun and educational tours – for free – where you can explore hives, learn about pollination and taste several different kinds of organic honey. At the Kapoho Warm Ponds you and your Valentine can unwind and let loose. A popular snorkeling destination, the Kapoho Warm Ponds are protected in the Marine Life Conservation District. Here, warm water seeps out of the surrounding lava rocks and into the pools creating a natural hot spring effect. The collection of ponds stays safe from waves thanks to a basalt ridge just off shore. It’s not Valentine’s day without a little sugar. So, what better way to celebrate than by visiting the Hawaiian Vanilla Company Farm and the Hawaiian Chocolate Factory. The Vanilla Experience Luncheon & Farm Tour is the perfect way to learn about this working farm and also taste some delicious vanilla-infused product. And chocolate factory tour? Yes please! For the thrill-seeking couple, take a helicopter tour! It’s perhaps the most adventurous way to see the island, but there’s nothing like seeing Hawaii’s shoreline from above or being a part of a breath-taking Hawaiian sunset. For the ultimate Valentine’s Day in Hawaii getaway, stay with us at Chalet Kilauea Hotel. 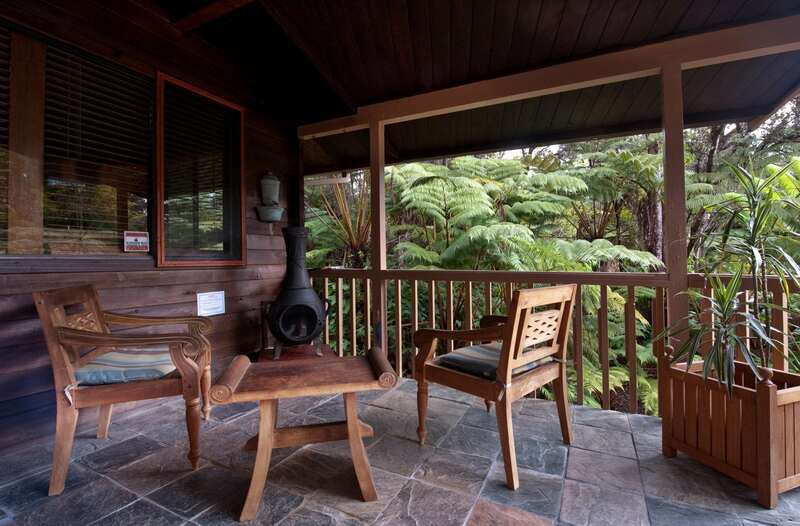 Chalet Kilauea Hotel is our luxury accommodation option that houses beautifully designed rooms – some stand-alone bungalows – inspired by the rainforest. These luxury rooms feature private baths and offer daily housekeeping and free wireless internet. The property’s amenities include a garden gazebo, koi pond hot tub. Free coffee and tea are always available when the hotel office is open. Looking for more Valentine’s Day in Hawaii Ideas? Check out more of our favorite activities here. Planning a visit? Stay with us! Visit our Properties & Rooms page to learn more about our lodging options for solo travelers and families.